A major tragedy was averted today when around 100 members of 15 migrant families, settled at Sarabha village, near here, escaped unhurt when a fire gutted their jhuggis. 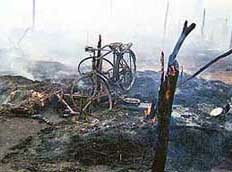 The fire reportedly started from embers in a hearth. The Circle Education Officer (CEO), Nabha, has directed DEOs and heads of the government schools falling under his jurisdiction to follow instructions received from the Education Department in letter and spirit. The SAD president, Mr Parkash Singh Badal, has done a perfect balancing act by ensuring the return of former minister and party general secretary Mahesh Inder Singh Grewal as the additional secretary of the Nankana Sahib Educational Trust. The city police has arrested three brothers allegedly involved in a robbery in the house of a transporter last March. It has recovered 400 gm of gold and Rs 1.15 lakh from them. Zee TV has brought singers of “Ek Main aur Ek Tu” right into the homes of city residents. Of the nine couples that participated in the popular singing programme, seven have been left in the fray. 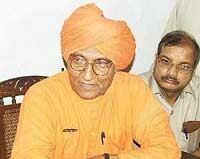 The Arya Samaj will launch a mass movement across the country against foeticide. It has also reiterated its demand for a ban on abortions. It will coordinate with leaders of other religions to build a consensus against this social evil. When the newly appointed city SSP was holding his press conference about the unique sales tax evasion in the sale and purchase of 300 cars, the Haibowal cops, who had exposed the scandal, were boasting of the success for another reason. The cops were claiming that their police station was lucky for the city SSPs. The All-India Ramgarhia Vishwakarma Federation has resolved to launch a drive against social evils and to bridge the gap between the rich and poor. The Congressmen in Ludhiana are badly divided. This has been proved by the cancellation of the rally being organised by Mr Malkiat Singh Birmi, Chief Parliamentary Secretary, 24 hours before it was to be held on April 16. 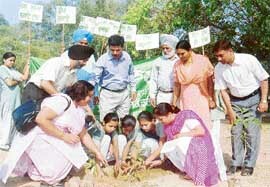 Students and staff of various schools in the area celebrated World Earth Day yesterday. Besides planting fruit saplings and cleaning the surroundings, the students participated in seminars and exhibitions highlighting the need for environment conservation. The Communist Part of India has come out in support of the people of Nepal in their struggle for the restoration of democracy. It also noted that more and more people were taking to the streets with determination to overthrow monarchy despite the curfew and all sorts of other repressive measures. The future of South Asian nations cannot be termed brilliant until Indians and Pakistanis are free to travel between Kabul and Kolkata, Mr Bal Anand, former Deputy High Commissioner at the Indian Embassy in Pakistan, says. 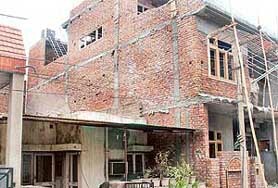 A resident of the Punjab Housing Board Colony, BRS Nagar, has been struggling for more than a month to get a window closed which had been opened by his neighbour, but to no avail. The merits and demerits of the Punjab Public Information Act were discussed at length at a seminar and declamation contest organised by the local Book Bank Society at Library Hall here today. Mr Sukhwinder Singh Gill, SDM, presided over the function and Mr Virender Kumar Sharma, District Science Supervisor, was the chief guest. Leaders and workers of the Bharatiya Janata Party today organised the recital of “mahamrityunjay mantra”, praying for the long life of Mr Pramod Mahajan, who is battling for life in a Mumbai hospital. Harbans Kaur(73), mother of Mr K. S. Cheema, Chief Judicial Magistrate, Ludhiana, died here yesterday around 11 am. She had been suffering from illness for some time. She remained admitted in the local Deepak Hospital for couple of days. 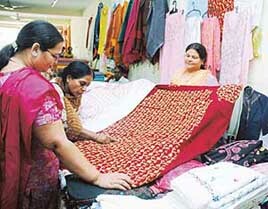 The Akhil Bhartiya Dastkar Samiti is offering residents a unique opportunity to buy articles made by craftsmen without middlemen. As many as 45 craftsmen from different states are displaying their wares at the Nehru Sidhant Kendra. The exhibition will be on until April 30. Gujranwala Guru Nanak (GGN) Khalsa College of Pharmacy organised an interactive workshop 'Impetus-2006' for its students here today. The workshop was organised with a view to enhance the awareness levels and develop the professional skills of the budding pharmacists. Senior students of GMT Senior Secondary Public school held an inter-house fancy dress competition. The chief guest was Dr H. S. Sidhu, Principal of GMT college of Education, while Mr Kashmir Singh Thind, Director of the institute, was the guest of honour. As many as 400 persons donated blood at a camp organised by the Sant Nirankari Mandal at Satsang Bhavan here today. The blood was given to blood banks at Dayanand Medical College and Hospital, the Civil Hospital, the District Red Cross Society and Dr B.L. Kapoor Memorial Hospital here. Volunteers donate blood at a camp organised by the Sant Nirankari Mandal in Ludhiana on Sunday. — Tribune photo I.V.